This is a boastful tale of how I used psychology to win dominate a football prediction contest. Back in September, I was asked to represent my department – Operations and Information Management – in a Wharton School contest to predict NFL football game outcomes. Having always wanted a realistic chance to outperform Adam Grant at something, I agreed. The contest involved making the same predictions that sports gamblers make. For each game, we predicted whether the superior team (the favorite) was going to beat the inferior team (the underdog) by more or less than the Las Vegas point spread. For example, when the very good New England Patriots played the less good Pittsburgh Steelers, we had to predict whether or not the Patriots would win by more than the 6.5-point point spread. We made 239 predictions across 16 weeks. Contrary to popular belief, oddsmakers in Las Vegas don’t set point spreads in order to ensure that half of the money is wagered on the favorite and half the money is wagered on the underdog. Rather, their primary aim is to set accurate point spreads, one that gives the favorite (and underdog) a 50% chance to beat the spread. Because Vegas is good at setting accurate spreads, it is very hard to perform better than chance when making these predictions. The only way to do it is to predict the NFL games better than Vegas does. My approach to the contest was informed by two pieces of information. First, my work with Leif (.pdf) has shown that naïve gamblers are biased when making these predictions – they predict favorites to beat the spread much more often than they predict underdogs to beat the spread. This is because people’s first impression about which team to bet on ignores the point spread and is thus based on a simpler prediction as to which team will win the game. Since the favorite is usually more likely to win, people’s first impressions tend to favor favorites. And because people rarely talk themselves out of these first impressions, they tend to predict favorites against the spread. This is true even though favorites don’t win against the spread more often than underdogs (paper 1, .pdf), and even when you manipulate the point spreads to make favorites more likely to lose (paper 2, .pdf). Intuitions for these predictions are just not useful. 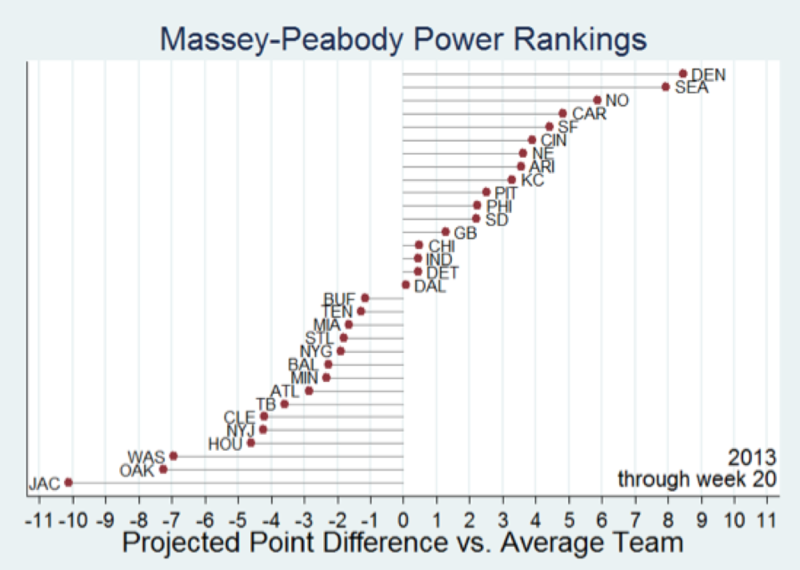 Second, knowing that evidence-based algorithms are better forecasters than humans (.pdf), I used the Massey-Peabody algorithm for all my predictions. 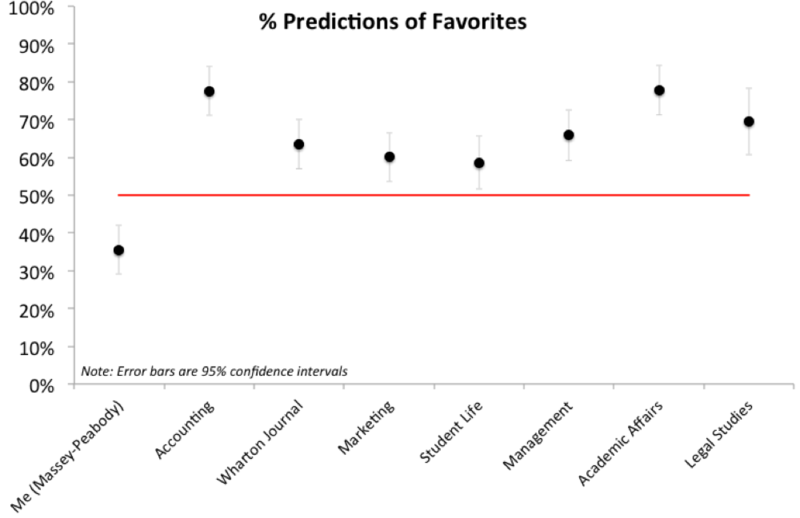 First, did my Wharton colleagues also show the bias toward favorites, a bias that would indicate that they are no more sophisticated than the typical gambler? Yes. All of them predicted significantly more favorites than underdogs. Since everyone loves a humble champion, let me just say that my victory is really a victory for Massey-Peabody. I don’t deserve all of the accolades. Really. 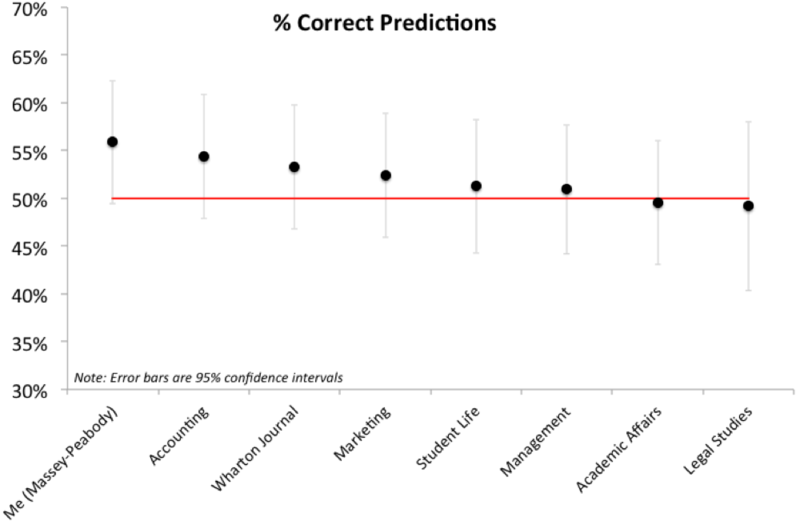 Yeah, for about the millionth time (see meta-analysis, .pdf), we see that statistical models outperform human forecasters. This is true even (especially?) when the humans are Wharton professors, students, and staff. So, if you want to know who is going to win this Sunday’s Super Bowl, don’t ask me and don’t ask the bestselling author of Give and Take. Ask Massey-Peabody. And they will tell you, unsatisfyingly, that the game is basically a coin flip.